A Little Of Your Help Can Prove That 'Evolution Needs Participation'. Driven by curiosity and passion, we at Spark Racing Team believe and seek to inculcate the practicality and knowledge of engineering towards greater goals and endeavors in the world of automation. 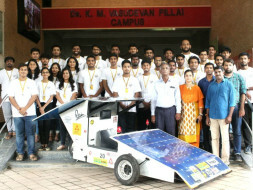 In our juvenile yet steady attempt of competing in the Formula Green by ISNEE by fashioning an electric vehicle, we not only have a name to uphold but a need to create room for excellence and improvement. The financial aid from here will not only help us fabricate our vehicle but also groom us for the fast building entrepreneur world. Thanks to our support we have reached to the manufacturing stage, and we would be participating in Formula Bharat 2019. Our team has stood 17 in quiz round and completed with most of the document submission. We apologize for late update, as we have completed our designing now we would be entering to manufacturing stage. If you wish to see our update click the link below. Thank you for all the support. Since the past 4 months, members of Spark Racing Team have been striving hard for days and nights to achieve our dream of building this electric car come true. Finally, the design of our car is ready and we are planning to start the manufacturing phase. So we are withdrawing the funds raised by the campaign as we need it for purchasing the raw materials, for machining and some other components. The funds will be withdrawn to our team account which is handled by one of our member, Atharva Joshi. We are still continuing this fundraising campaign on Milaap as there is still a requirement of funds. We would request our supporters to spread this message amongst your family and friends circle to help us in raising funds. Thank you for the support. Will keep you posted.